When one enters the University of New Mexico at Gallup, it’s hard to not notice the striking copper-clad building sitting at the front. The Gallup Technology Center, a two-story structure designed by RMKM Architects, was designed to both showcase the university’s technical prowess in addition to bridging the gap that existed between the university’s mountainous backdrop and the campus. For the building’s aesthetic, architects sought out materials that would help create a warmer, deeper, earthier ambiance. 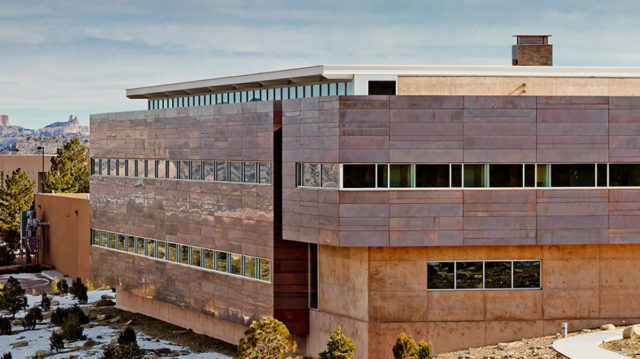 To achieve the desired look, designers turned to copper rather than aluminum, as its warm appearance complements the red desert sandstone hills surrounding the campus. Project challenges emerged in the form of fluctuating temperature, as New Mexico can experience temperature swings of about 40°F. Because of the different expansion and contraction rates between aluminum and copper, using an aluminum-backed copper composite panel would have resulted in warping. The warping would inevitably compromise the structural integrity of the building’s panels. To resolve this issue, RMKM used ALPOLIC® Copper Composite Material (CCM), which has copper bonded to both sides of the panel. To ensure that the CCM retains its appearance, Lumiflon FEVE resin was applied to each panel. The FEVE resin technology in Lumiflon provides surfaces with superior weatherability, color and gloss retention, and durability. This is ideal for a high exposure building like the Gallup Technology Center, as it constantly experiences harsh UV radiation in addition to elemental deterrents that would cause coating degradation. The LEED Gold Gallup Technology Center won the top design award at the 2013 convention of the New Mexico Chapter of the American Institute of Architects.